Last year, HandyMan and I organized Toronto’s first Pecha Kucha. “Pecha Kucha” is a Japanese term which means “the sound of conversation”. A Pecha Kucha is also a global phenomenon… it’s a forum where architects and designers can get together and network and discuss their newest works and most original ideas. The event itself has a distinct format: presenters show 20 slides, each slide for 20 seconds. This creates a fast-paced, high-energy event – each presenter has only 6 minutes 40 seconds to dazzle you with their creativity. Yeah, baby. 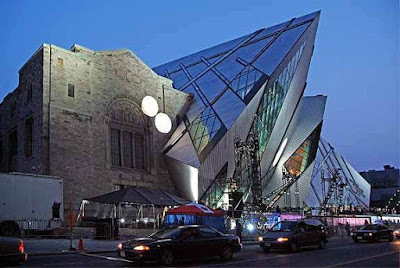 That's the Royal Ontario Museum, with its spectacular new Daniel Libeskind-designed Crystal. More details to follow… but if you’ve got a suggestion on a great presenter, let me know! good luck with pecha kucha! PK II will for sure rock the city! can't wait! Hmmm, too bad you can't access the site ad. Maybe you could try going to the hgtv.ca home page and access the videos from there? Too bad as it was a really informative episode!